...and her family...who's always awaiting her next adventure! It has been fairly "calm" in our home this summer…with the boys working a bit mowing lawns and many of the neighborhood kids growing up and stepping out into new things. With this "change of season", I find myself thinking more of summers from when I was a kid…Summers spent on the Hill with friends or at the pond with my girl friends floating all day, burning to a crisp. There was marching band, fairs, picnics, horse (and cow) rides (another story for another time! ), bon fires, dirt bikes, camp-outs and the occasional trip to the middle of no where to rescue my younger brother and his friends from doing things we still have not confessed to our parents!! Surprisingly, I have welcomed this "quieter season" and find comfort in the memories. This morning, Naughty and I went out in her newly fenced in area to enjoy the sunshine while I finished my coffee. She was dozing on the porch until her nose caught a whiff of something on the other side of the fence. A bunny. I knew instantly what it was as her "bay" echoed for what felt like an eternity. (After all, the neighbors WERE sleeping…I'm sorry Maple Street Family…again…) The only issue with this bunny was he was on the other side of the fence. There was no direct path to him. And I guess Naughty decided it was too early to exert the energy to dig under…any other time, she would've and escaped to wreak havoc on the town. Instead of digging, scratching, or jumping she simply sat down and began to wait. The bunny was sure to get close enough, or maybe even slip under the fence. 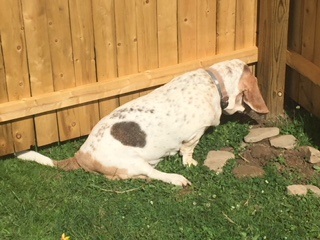 Mind you, it is now almost three hours later and she is still "plopped", waiting… This morning, while sitting in one of those "quieter times" watching Naughty patiently waiting on the bunny, I was reminded of one of the times in my life where I found myself "plopped" asking God, "Why?" I can't say I was "plopped patiently". I was "plopped" more in a "hissy-fit" kind of "plop". It was a Friday night in January of 2006. I had just pulled in late with the boys from spending the day with my Gram who was fighting the battle of her life. She had received the diagnosis about a year prior that her cancer had returned after many years of being cancer free. My Gram is that "one person" in my life. The "one" who lead by example. She never harped, preached, criticized. She never had a drink. She never smoked. She had suffered great loss in her life, yet never spoke one ill word. She was different than anyone else I knew. She gave, even when she didn't have it to give. She loved, even when the "unlovable" came knocking on her door. Her house was always open to anyone and the coffee was always on. And if you hit it on the right day--there was pie. Apple pie. This particular evening was unusual. There had been many people in and out of her house helping with her care, housework and running errands. But this night people we hadn't seen in what seemed like forever randomly visited and sat with Gram, loved on the family and offered any kind of help. After all of that, all of God's special little "moments", surprisingly, I drove home that night angry. Bitter. I was a "baby Christian", only knowing Christ three years. I had prayed for God to heal my Gram. That's what God does? Right? He "fixes" stuff. I had asked for her to be on every prayer list in existence. That night, I found myself in the van in the dark. My husband had taken our very worn out boys in for bed. I prayed. I prayed the "angry prayer". The prayer where you're banging the steering wheel with your fists as tears stream down your face. "God--WHY? Just take her. Please! Take her in her sleep. Don't let her suffer any more." The next morning I readied the boys and headed to Gram's. I received a call from my brother telling me to hurry. I will never forget what I saw as I entered her home. 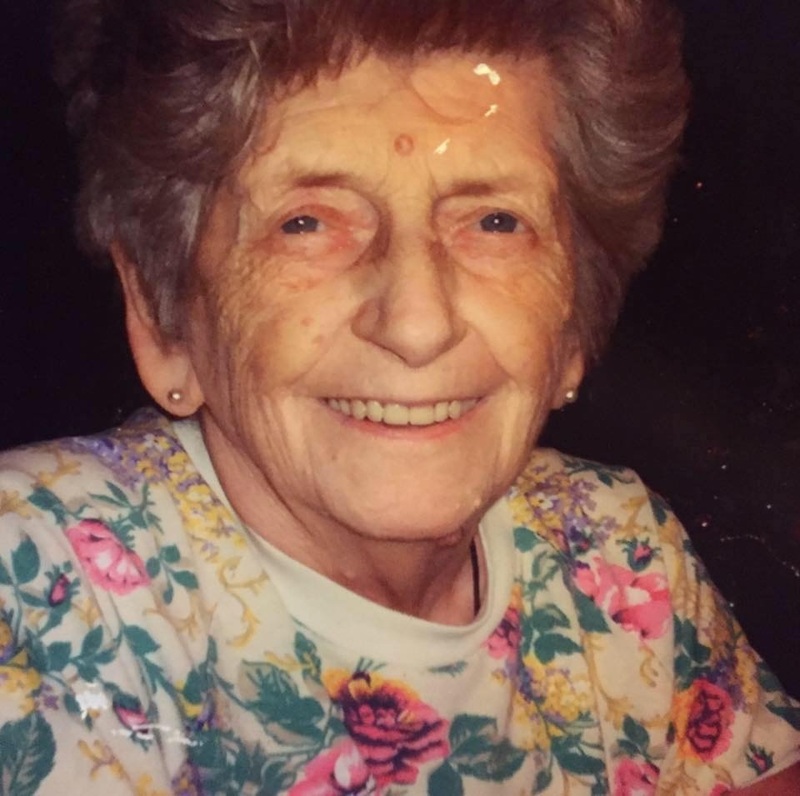 My Gram, sitting in her chair, surrounded by family, friends, neighbors, my "Old Aunties", grandchildren, great grandchildren…I walked up to her and hugged her, told her I loved her. She simply said, "Home"… and left us. Our family and friends have experienced some great losses this spring and through the summer. We all have seen the worst case diagnosis given, and witnessed some major disappointment when the answers to our prayers haven't been what we thought they should be. It has been trying and a struggle to "remember" and not grow angry or bitter--or question, "Why?" 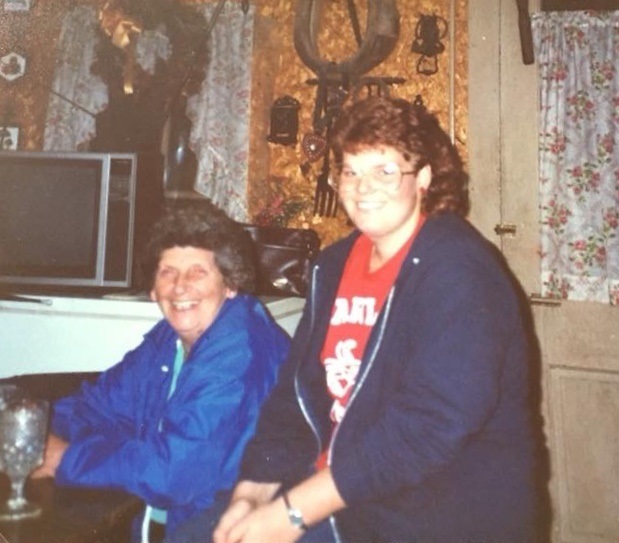 I look back on that night before God called my Gram Home, and what a selfish place I was in. At the time, my prayers seemed justified. But God's Plan wasn't acknowledged--nor did I show any interest in it. I knew what was needed. I knew what I wanted. The morning my Gram left, God revealed to me something I couldn't even fathom. His Purpose. His Plan. I saw her testimony shine so brightly to all of those around her, I saw the 83 year road she had walked, the hard times she had pressed through. I saw the laughter in her home, the warmth. I witnessed God use my Gram, in her final "act", and with one word, with insurmountable peace, she spoke Truth to her family and friends around her-- Some saved, some of us discouraged, some questioning, some unsaved, and some of us just weary from the road we had all traveled together. I have to say, He had a MUCH better plan. Hearts were made open that morning to so many through what we witnessed. I physically felt a piece of me leave with her that morning. A piece, after 12 years that is still missing. But I know it will one day be complete again when we are together in Glory…with the One who calls us "HOME".